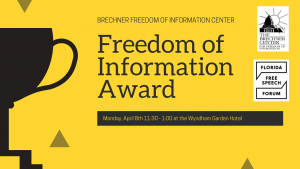 The Joseph L. Brechner Freedom of Information Award is an annual $3,000 cash award, sponsored by The Brechner Center. The award recognizes excellence in reporting about freedom of information, access to government-held information, or the First Amendment. April 8 @ 11:30 am - 1:00 pm Please register by Thursday, April 4th.